1924 — Jimmy Carter was born on October 1, 1924 to the parents of Earl and Lillian Carter in the small town of Plains. 1928 — Earl Carter bought a 350 acre farm 3 miles from Plains in the tiny community of Archery. The Carter family lived in a house on the farm without running water or electricity. 1930 — Jimmy Carter began first grade at Plains High School. 1941 — Graduating from Plains High School, he enrolled at Georgia Southwestern College in Americus. 1942 — He transferred to Georgia Institute of Technology in Atlanta. 1943 — Jimmy Carter’s boyhood dream of being in the navy becomes a reality as he is appointed to the U.S. Naval Academy in Annapolis. 1946 — He received his naval commission and on July 7, 1946 married Rosalynn Smith of Plains. They moved to Norfolk, Virginia. 1946-1952 — As a naval officer, Jimmy Carter moved his family to several locations including: Virginia, Hawaii, Connecticut, California, and New York. During this time three sons are born, Jack in 1947, Chip in 1950, and Jeff in 1952. 1953 — Earl Carter, Jimmy’s father, died of cancer. Lt. Jimmy Carter resigned from the navy returning with his family to Plains to run Carter’s Warehouse. 1953 — Due to a limited income, Jimmy, Rosalynn, and their three sons moved into Public Housing Apartment 9A in Plains. 1954-1962 — As a young man returning to Plains, Jimmy Carter realized the important role his father played in the community. He began to get involved serving as a member on several local boards. Education was important to him, so he accepted an appointment to the Sumter County Board of Education. 1962-66 — Jimmy Carter is elected to the Georgia State Senate and serves two terms. 1966 — He ran for governor, but lost to Lester Maddox. 1967 — Jimmy and Rosalynn Carter’s fourth child, Amy, is born. 1971 — He ran for governor again and won the election, becoming Georgia’s 6th Governor on January 12, 1971. 1974 — Jimmy Carter announced his candidacy for president. Thousands of people visit Plains in hopes of meeting him. The town changes from agriculture based businesses to tourist shops selling souvenirs. 1976 — November 2, 1976, Jimmy Carter was elected 39th President of the United States, narrowly defeating incumbent Gerald Ford. 1977 — Jimmy Carter was inaugurated President of the United States of America on January 20, 1977 in Washington, D.C. President Carter addresses the country on energy needs. The Panama Canal treaty is signed. 1978 — U.S. and the Peoples’ Republic of China establish full diplomatic relations. President Carter negotiates and mediates an accord between Egypt and Israel at Camp David. 1979 — The Department of Education is formed. Iranian radicals over run the U.S. Embassy and seize American hostages. The Strategic Arms Limitations Treaty (SALT II) is signed. 1980 — The Alaskan National Interest Lands Conservation Act is signed. A rescue attempt to get American hostages out of Iran is unsuccessful. Jimmy Carter was defeated in his bid for a second term as President by Ronald Reagan in November. 1981 — President Carter continues to negotiate the release of the American hostages in Iran. Minutes before his term as President is over, the hostages are released. Former President Carter leaves Washington, DC and heads to Germany to greet the hostages. President and Mrs. Carter return to their home in Plains, Georgia. 1982 — Jimmy and Rosalynn Carter after much planning and fundraising etablished The Carter Center in Atlanta. Click here for The Carter Center. 1986 — The Jimmy Carter Library and Museum and The Carter Center in Atlanta opens. 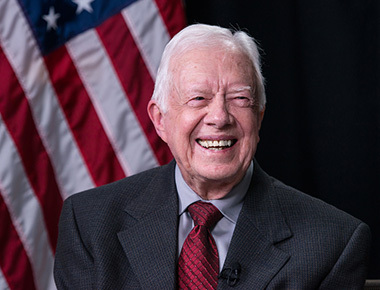 Click here for The Jimmy Carter Library and Museum. 1987 – Present — President and Mrs. Carter live in Plains, Georgia and travel all over the world helping others through their work with the Carter Center and the Rosalynn Carter Institute. The Carters continue to work to resolve conflict, foster democracy and development, and fight hunger, disease and human right abuses in Asia, Africa, Central America, South America and the United States. In addition, they volunteer one week each year to work for Habitat for Humanity. In Plains, Georgia, the Jimmy Carter National Historic Site was established in 1987. The National Historic Site includes the Depot Museum, Plains High School Museum, and the Jimmy Carter Boyhood Farm.